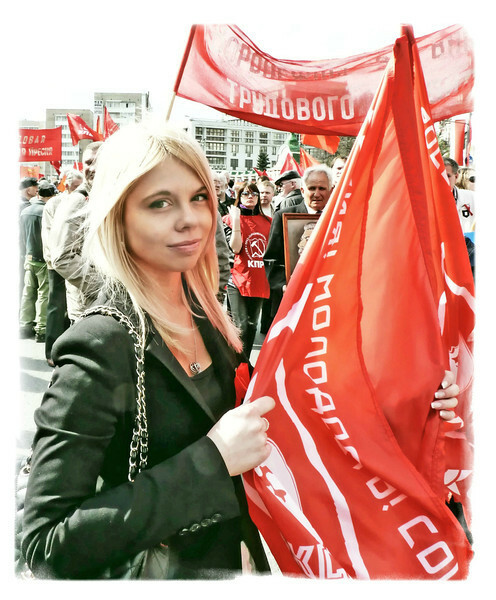 Rustem went to yesterday's May Day demonstrations. I stayed in as I had work to do & next week we'll have the Victory Day celebrations/demonstrations. Each group had their assigned protest places in the city center. Rustem visited the Communists, Young Socialists & Left Radicals demonstrations. I chose this shot. Thanks for all your comments yesterday. Much appreciated. wonderful shot, and photojournalism ! I've heard that Russia is a "Beauty Factory"...this young lady proves it! I love this...quite a story!~thankyou! Her smile is totally engaging. The red is great too. I would not have known the background story had you not shared. Thanks. Such a great scene ! Such gorgous colors and portrait!